For those of us whose faces don’t immediately light up with recognition when we hear the name Hohenlohe-Langenburg, don’t panic, you’re not alone. I’m guessing most Americans haven’t heard of the German princely house of Hohenlohe, much less not-warrior Princess Xenia (pictured below) or the cadet branch of the family to whom this amethyst corona belongs. 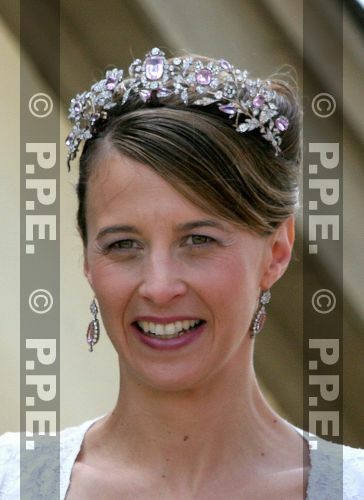 Princess Xenia of Hohenlohe borrowed her cousins’ tiara. I think this seldom-seen tiara is pretty underrated, it’s a really gorgeous example of stone-setting with its blossoms, berries and leaves. I wish there was more–nay any–information about this tiara out there, alas the Internet has a finite amount of information, especially on the subject of sparkly headgear. Apparently made around 1870, this tiara’s amethysts adhere to the more traditional hue of deep purple. (I would have thought Hohelohe-Langenberg number was set with pink quartz or pink sapphires based on their color but who am I, a geologist?) The diamonds framing these spectacular stones are curling grape vine leaves…no grapes though. You’d think the fabulous fruit that provides wine would get its due in gemstones one of these days. Grapes, don’t despair, you have earned it. Hmmm…that puts me of the mind for a glass of that Ribera del Duero. It is after noon on a Sunday; that’s like after 5 on a weekday. Okay, before you pin your Blog Hostess as a drunk (oenophile! different! ), let’s get back to the theme week and the above tiara, whose amethysts are the shade of a nice Malbec. The moniker seems odd considering that the tiara is owned by the Duke of Bedford. Technically it’s named after the dukes’s first son, who by the rules of honorifics is allowed to use his father’s second-highest title (the Marquess of Tavistock) as a courtesy. That’s a mind-bender of a rule, as technically that makes both father and son the marquess, the younger of whom will one day be the duke as well. A titular doppelgänger, so to speak. If the first son will become duke, why not let the second son be a marquess? At least name the freaking tiara after a daughter! Why do the second sons and daughters always get low-balled? Well, now We’re getting into the plot of Downton Abbey, so before We start to ramble on about wine and women’s equality, Blog Hostess out! This entry was posted in amethyst, england, tiara time! and tagged Amethyst, amethyst necklace tiara, amethyst tiaras, Birthstone, england, February, Hohenlohe-Langenburg, hohenlohe-langenburg tiara, humor, marquess of tavistock tiara, princess xenia of hohenlohe. Bookmark the permalink.